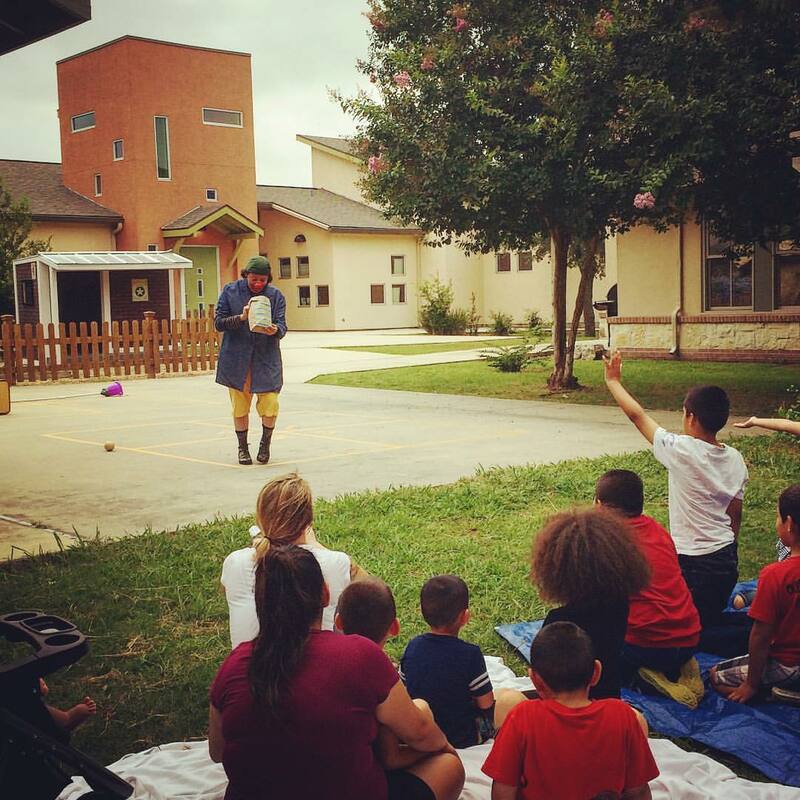 Unlike last year’s project in San Antonio, when all of our work took place at St. PJ’s Children’s Home, this year’s project has had the clowns touring our show to some children’s homes and facilities around San Antonio. We’ve presented our show six times around the city. At St. PJ’s Children’s Home; The Children’s Shelter; SW Key Casa Blanca; a residence for women and child survivors of domestic violence; and one final performance for a summer camp crowd, 150-kids-strong, in the North East San Antonio school district. Over the course of the tour, we’ve played for a wide range of ages—from infants through adults—and for both English- and Spanish-speaking audiences. 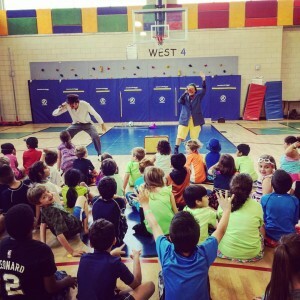 Our first performance, with our largest audience, took place in the huge gym at St. PJ’s children’s home, where the entire campus—including domestic kids, international youth, and staff—were all in attendance. The energy was high and focused, and the crowd cheered us on. Luther’s juggling and Sayda’s paper bag trick drew wide eyes, dropped jaws and giggles. This crowd was especially responsive to our closing number: a ukulele, mouth trumpet and sitar version of “Cielito Lindo.” Both staff and youth sang along. The performance was a great introduction to this community of which we would become a part of during this two-week-long project. In the hours and days after the performance, children around St. PJ’s greeted us with shy smiles or shouts of, “Look! It’s the clowns.” One child came over to Luther at lunch on the day of our performance and said, “Excuse me, um…This apple looks like your red nose.” It was ADORABLE! Our second performance was for a group of young mothers and their infants, and mothers-to-be, who have crossed the border from Central America alone. They were one of the warmest audiences of our tour. 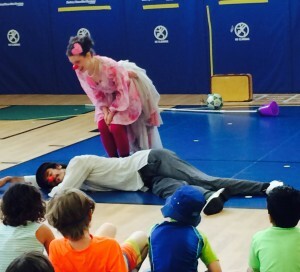 We started off our performance a bit careful when a small child started crying early in our show. We took a bit of physical distance from him and gave him some space since he seemed a bit afraid of these strange beings with red noses. But by the time Sayda played her paper bag act, the same child was engaged and giggling, delighted by the opportunity to toss the invisible ball for Sayda to catch. The girls also laughed when Marisol played her mouth trumpet “When The Saints Go Marching In” to one girl’s very pregnant belly. It’s never too early to foster silliness and art appreciation! Is Luther dead, or alive? Our third performance took place in what seemed to be a converted garage space, carpeted with extremely high ceilings, at The Children’s Shelter. We arrived in the performance space to find a plethora of small bicycle. It’s like clown nip! We could not resist trying them out, and we adapted our show opening to incorporate these perfect clowning props. We practiced opening our show with a clowns-on-tiny-bicycles chase and determined that it would be a fun and unexpected beginning. At show time, we dove right into our high octane bicycle chase, but Marisol’s bustle almost immediately became tangled in her tiny bicycle wheel! She had to remove the bustle and play the rest of the show without it. No big deal! The rest of the show—played for infants through 10-year-olds, and their adult staff—went off without a hitch. This audience was especially emphatic about helping Marisol revive Luther during their “Dead or Alive” act, in which Luther tricks Marisol into thinking that he’s dead, all the while confirming with the audience that he is, in fact, playing a trick on her. “Tickle him!” they suggested. “Throw water on him!” “COLD water!” During the newspaper act, when Sayda and Luther finally sat together and decided to share the seat and the newspaper instead of fighting over it, we were delighted to hear the kids affirm that, “Sharing is caring.” What a fantastic sentiment! This performance was one of my personal highlights of the tour. The show got off to a late start as the residents trickled in slowly. The audience sat further away from us than we’d expected and were a bit slow to warm up to the clowns. But by a couple of acts into our show, the kids were inspired and felt empowered to swarm the stage, and nearly as soon as the kids got in on the game, the show exploded into a giant, utterly participatory event, with the little ones taking over the Newspaper and Dead or Alive acts. It was crazy!! And it was clearly a much-needed release of energy and play for these kids, who’ve experienced major challenges and traumas in their home environments, and, often, the need to grow up far too fast. Staff members at the shelter told us that the kids there don’t get many opportunities to play with adults, and I was thrilled that they’d taken advantage of the opportunity to play with us, even if it did sort of derail the performance. After all, we are here to bring smiles, laughter, and play in any way that we can. After the show, several of the children stuck around with us, asking questions, practicing their funny voices, and continuing to engage us in play until it was time to head inside for classes or lunch. The newspaper act teaches sharing. And it’s true that love has been an important theme of our time together in San Antonio. At each one of these facilities, we’ve been moved to see a deep love, care, and respect with which the staff members support the residents. It is heart-rending to think of the trauma that these kids have experienced in their home environments and on their journeys to get here—but also tremendously inspiring to see their resilience, their desire to play and smile, their enduring ability to show affection and to feel delighted.